Jobs for Teens - Are you having a hard time landing that part-time or summer job? Looking for a part-time job or a summer job as a teen can be a bit of a daunting task, but by being creative and thinking outside of the box, you can learn to be your own boss and even make more money over the course of a summer and the remainder of the year, than most part-time teenage job offers. In this article, you'll learn the basics of making money on Blastifieds. Whether you're still in high-school or college, millennials end up drawing the short-end of the stick when it comes to local jobs. Typically, local workers who are no longer in school or those who have already graduated, have more flexibility with their time to be able to take on work for any shift. This allows them to get a big jump on teens who are mainly entering the job market only during certain times of the year. Looking for a part-time or summer job? Here's some additional options. Whether your potential part-time job is at a local theme park or ice-cream shop for the summer, or whether it's a fast food restaurant or grocery store (which might call for working at night)... finding a good paying part-time job can be a real drag. Check this out... a typical teen job pays somewhere around the $8/hr range. Multiply that out for a 20 hour week and you've just earned $160. This means that we need an out-of-the-box-strategy in order to make more money and get ahead. So, what is that out-of-box-stategy? It's to start thinking like an entrepreneur and learn how you can make money on your own. Once you can make money on your own, you can move just about anywhere in the world, with very little and get up and running, because you'll have experience. Okay, so all new business ventures need access to some seed money. Did you know that even though you might not have a direct line to cash right now, you can make some with items currently in your closet or lying around your house? Those items can be advertised and sold online for extra money. Whether that be toys, video games, old smart phones, etc. Those items are just sitting around collecting dust and providing $0 in Current Value to you. It's time to cash in on these items and use that money as "seed money" to buy and re-sell other goods for a profit. Your goal should be to turn every $1 you spend, into $3 (so a net gain of $2). So, if you buy $50 worth of inventory that is in good shape and in-demand at your nearest Goodwill or Thrift Store, clean it all up, then post the items on Blastifieds... you'd want to target selling each item individuallly, but with a total return of $150 (so a net gain of $100). You've probably heard the phrase, "one person's trash is another person's treasure". Well that phrase has never been truer than right now... just think about the millions of people who flock online, just to look at what others are selling. The first part of this process is to designate a corner in your room where you can start gathering items that you haven't touched in over 12 months (we call this your Money Making Corner). Also, go grab a packet of sticky-notes, as we're going to start pricing out an inventory of your items ready to sell. I recommend using sticky-notes to price your inventory, because they're cheap and easy to use. Each item that you're selling will be labeled with a sticky-note to help you determine and keep track of the item's Estimated Value. On this sticky-note, we want to use a pen and divide it into 3 sections (similar to the sticky-note image below). On the top-left corner of the sticky-note, we'll label it "Yard Sale Price", the middle section we'll label it as "Goal Price," and the third section, we'll label it "Brand New Price". Once we've picked out the first item we want to sell, let's start filling out our sticky-note. 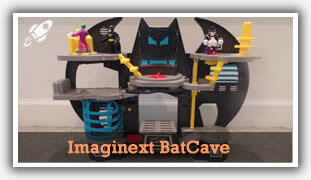 I've grabbed an Imaginext BatCave as an example to advertise on Blastifieds.com. In the Yard Sale Price section of the sticky-note, we want to write a price we could easily sell the item for at a yard sale - - this is a price where you think you'd practically be giving the item away. The second section of the sticky-note is what we call the 'Goal Price'. We'll skip this section for now, because there's an easy way to calculate it. Skipping to the third section is the Brand New Price section - here we are going to write what the price of this item is if it was brand new at the store. We don't have to be exact here, but just close. A buyer will most likely never pay you full price of what they could buy something brand new for at the store. If a buyer happens to pay you the brand-new price or more, well then you have something in high-demand. Finally, we'll hop back over to the second section of the sticky-note, that we called the Goal Price... here, what we want to do is calculate 1/3 or 33% of the "Brand New Value". This is called the Goal Price because the pricing is ridiculously lower than if the item was still brand new. By pricing and advertising our item at the recommended Goal Price, we're not carving that final price into stone. Instead, Blastifieds acts as an open-market, where buyers could end up bidding up the final price due to its overwhelming popularity. So, continuing our Imaginext BatCave example... at a yard sale, we could easily get $2. Brand new and with all the pieces included, the item costs $40 at Walmart. So we'd want to calculate 33% and 50% of the $40 Brand New price, which is $13-$20, which I've set as my target Goal Price Range. Remember from what was mentioned up above, the Current Value of my BatCave toy to me right now is $0, since it's just sitting in a box in my closet. My goal is to turn that $0 into between $13-$20, with the hopes that my ad sparks a bidding war for a higher price. One huge plus with my Blastifieds ad is that I can choose to advertise across the whole country or just here locally. Overall, I've put in about 5-10 minutes of my time cleaning up the toy, taking photos, and creating my Blastifieds ad. 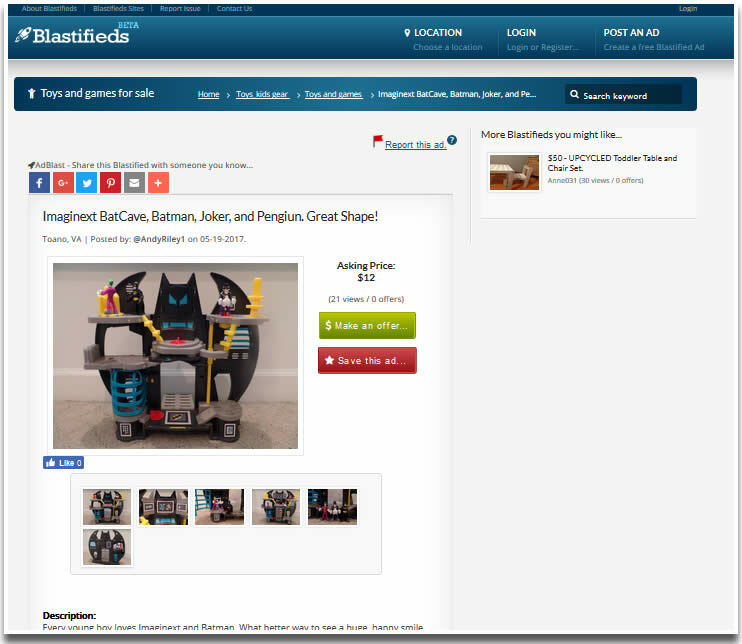 A sample Blastifieds listing for my Imaginext BatCave example. By selling my item on Blastifieds, I don't get charged a listing fee or additional selling fees like on eBay or other similar auction and classified ad sites. Imagine selling something for $1,000 and then having to pay an extra $50 to the platform you listed it on. That doesn't seem quite fair. In fact, the only time Blastifieds charges a fee is if you wanted to upgrade your listing to a "Featured Ad," which allows it to appear at the top of their search results. 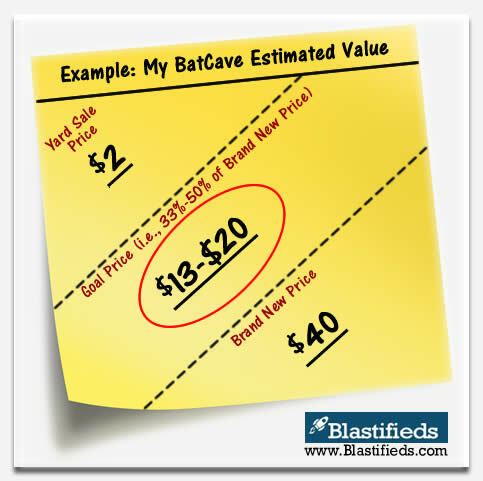 Also, a huge benefit of Blastifieds is if my item receives a ton of traffic (i.e., views and offers), I have a great chance of far-exceeding my "Goal Price". Okay, so you'll want to perform this same set of steps for each item that you have collected to determine all of your item's estimated values. Imagine netting yourself $15-$20 per hour... while your friends are slaving away at their part-time job wishing that they could make money on the side just as easily as you are! So, what are you waiting for? Your next step is to look around your room, home, and garage and find several items that you no longer use. Perhaps your parents could enlist you to help flip stuff they no longer need, as well. 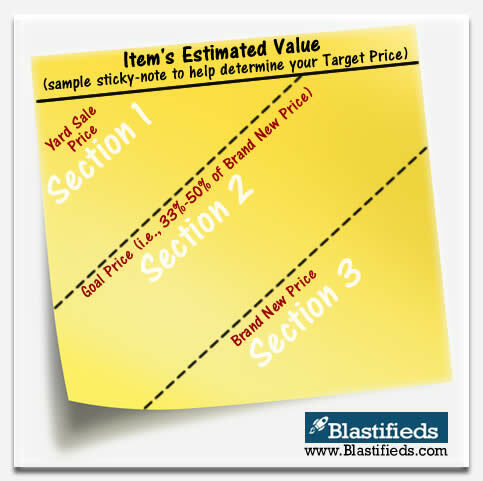 Be sure to follow our "Goal Price" activity with the sticky-notes, which is great at helping you determine price points for your items. Need help finding more items to sell? Your local Goodwill stores and Thrift stores are treasure troves just waiting for you to come and explore. Many times their prices are slightly higher than what you might find at a yard sale, but overall a great profit potential. Want to know more about Blastifieds? Blastifieds is a new, up and coming, online marketplace. Posting a Blastifieds ad is free and easy to do. You can track the number of visitors and offers that your ad has received, so you always know how your ad is performing. Welcome to Blastifieds! We're a brand-new online marketplace (for buying, selling, and even trading) and want to help you get things sold and making extra money on the side. We can even help you turn this into a Full-Time or Part-Time job. Every once in a while, we'll pull together Ultimate Help Guides to selling various things to give you a leg-up on the competition too. Get access to our Blastifieds Infographic - - 'Start Making Money the Entreprenuer Way'.